Carpets in Kashmir are known to be artistic, creative and warm as well. Syed Asma reports on the common man’s carpet, the Namda-the main forex earner before carpets took over. Namda, the felted woolen carpet, is a common winter flooring in Kashmir. It is inexpensive, affordable and long lasting, if stored properly. History reveals that about 60,000 Namdas were produced each year in Kashmir. These were not only used in Valley but exported to Europe, America, Australia and Japan. “Two decades earlier about 90% of this carpet production was exported from the Valley”, says a study done by Arifa of Crafts Development Institute. Namda has originated from Yarkand but Valley’s colourful flooring mat is said to be highly influenced by Persia. Major influence is believed to be of Iran and Turkey. It is said that in India this type of carpet was introduced in the times of Mughal Emperor Akbar. It was a person called Nubi who designed it for Akbar’s horse to save it from cold, the emperor was very impressed with the design and intricacies of the carpet and the craft has since made its place in the country. This carpet is commonly seen in the markets of Kashmir, Himachal Pradesh and Rajasthan. Namdas are thick soft carpets made either from wool alone or wool and cotton. The wool used is either of sheep or goats. The colorful floor covering is made all by hand. It is not woven as any other carpet is in the Valley but the fiber is compressed and then made to stick together. Namda formation is a long process involving extensive human labour. The wool is first cleaned from impurities and mixed with cotton, sometimes washed, dried and dyed. Then it is evenly spread on a mat (patij or wajuw) and soap water is sprinkled on it to make it stick to the mat. This soap is specifically meant for Namda locally known as Namdi saban and is presently available in only one shop at Khanikahi moalla. The fiber (wool and cotton) is beaten together on a mat. Then the beaten fiber is rolled with the mat and tied with a rope. It is moved (rolled) for few minutes and left out for hours, till each strand of fiber is glued properly. After many hours or even days the rope is untied and the roll is unrolled. The mat is opened and hands (palms) are used to sweep over it hard. The process is known as Mandun. Then the carpet is kept under a tap to take out the soaked soap and is left under open sun for few days to dry up completely. After such hard labour a carpet called Namda is formed. This is either left plain or is further beautified with coloured embroidery. Another form of Namda available is called ‘cut work-Namda’. In this type certain design are incorporated in the making itself, like a Namda piece already ready is cut into different shapes and sizes and put as the first layer. Then second layer of wool is spread and same process of spraying soap water etc is repeated. So, Namda in the market is available in three forms – plain, embroidered and with cut work. Plain is the most inexpensive, embroidered costs a bit more and Namda with cut work is expensive among all the three. Namda is available in three qualities: 30% wool and 70% cotton, 50% wool and 50% cotton and 100% wool. Namda is judged on the basis of the wool used, the more the wool the more is the cost. It is mostly present in colours like white, brown, grey and natural black. 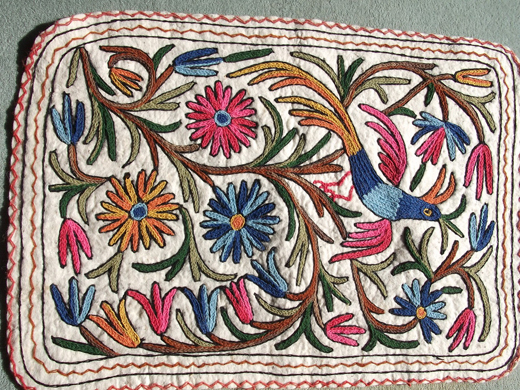 Kashmiri Namda is famous for hook embroidery (Aari kaem). The thread used for it is of cotton, wool or cashmelon. The major areas producing Namdas are Srinagar, Budgam, Pulwama, Anantnag, Baramulla and Kupwara. Arifa, 26, was one of the 20 students who studied Craft Management Entrepreneurship at the Craft Development Institute, Srinagar. She started her project ‘revival of Namda’ aimed at reviving “almost a dead art”. She introduced patterned and cut-work namdas and believes this intervention must help the age old craft. Sponsored by J&K Bank for Rs 245 thousands, Arifa has done 300 pieces of patterned Namdas. She participated in numerous domestic exhibitions and showcased the product. Arifa is presently working with 12 artisans and is planning to make them partners in profit once her business firm is properly established.